I said DX only!! This is the QSL card of LA9GY. 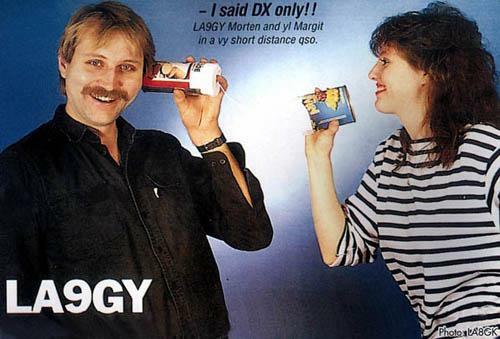 Morten (left) and xyl Margit (right). Welcome to the homepage of Morten Antonsen, LA9GY. Radio Amateur since the last part of the 1970s. Educated Ship Radio Officer at the Radio School/Norwegian Army's Signal Corps (Radioskolen/Hærens Samband). LA9GY works as press photographer at the newspaper Adresseavisen in Trondheim, Norway. Three children (Ellen, Elisabeth og Marie) with the wife Margit Wagnild.